Posting this a couple day’s later then I usually do, because I have been rather busy lately with other happenings and well, life. Already over the last month it has proven to be quite a wild month in weather! Many areas have received there first snowfall from the Plains to the Ohio Valley and Mid Atlantic States! While it may have been under and inch it was still earlier than average for snow to fall and the colder temperatures were also way below average. South Dakota and North Dakota and Minnesota as well as parts of Nebraska have also received significant snowfall already and is off to a very fast start! Honestly not much has changed from the last outlook, therefore I will not go over the same things over and over in graphics that I posted. I will go over a few key factors such as the NAO, climate pattern such as El Nino, La Nina or Neutral weather pattern and of course the current fall pattern setting up and the drought across the country. We have seen HUGE improvement in the Great Plains and Ohio Valley in the last few months! All thanks to large storm systems that have dumped lots of moisture over the same areas! Why does this have an effect on the winter? Because the more wet the top soil is the more moisture will be able to be drawn up out of the ground into the sky. Of course this isn’t everything when trying to ATTEMPT to predict what we will see over the winter but you can generally see the wet pattern across the country and where it might continue over the next winter. 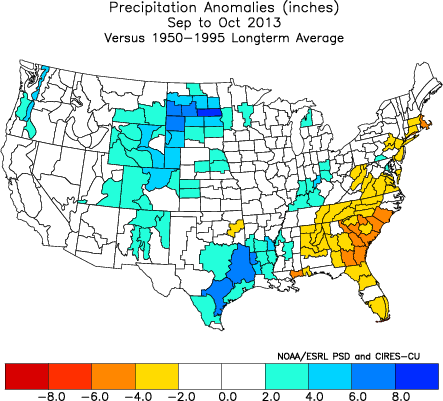 Here is the precipitation anomalies from September through October this year just to show you where the wet pattern has set up this Fall! 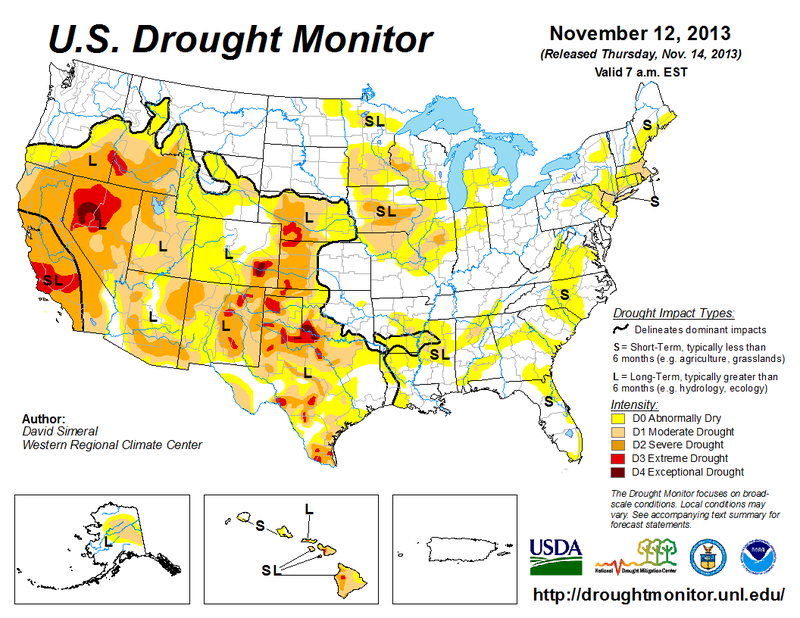 The wet pattern has generally set up shop over the drought areas! (Positive blue ranges) How about that! That is why they are recovering so well! 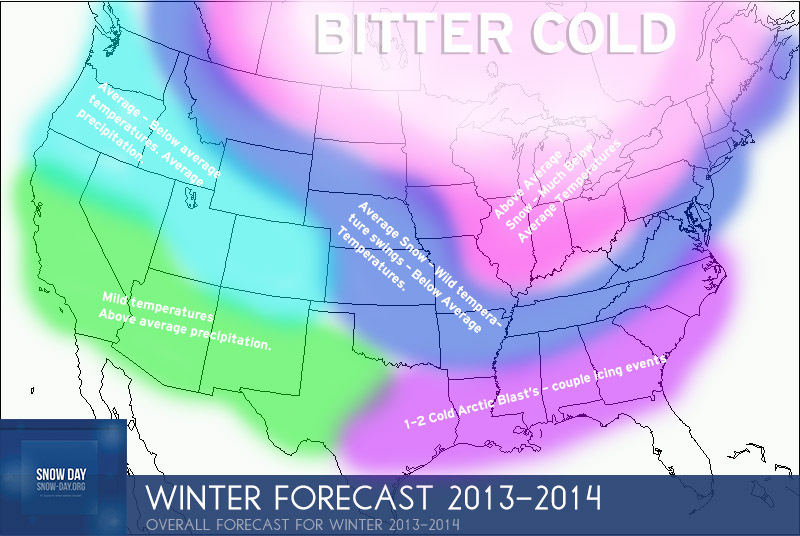 I included some of this area in my winter forecast graphic. Notice the southeast United States hasn’t seen much in the way of precipitation lately most likely due in part to a southeast ridge. 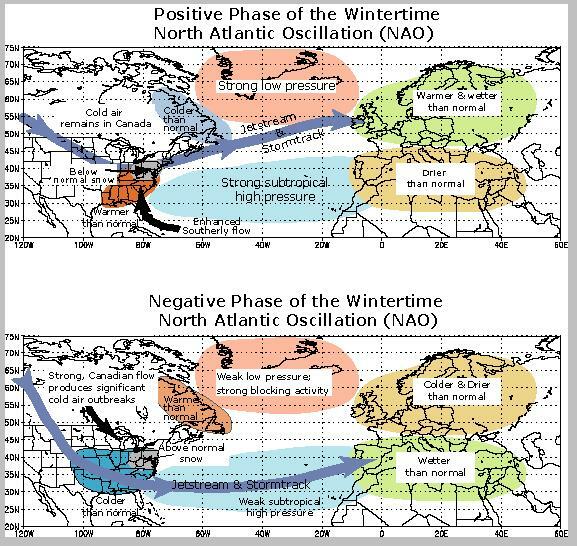 This is a VERY hand forecast graphic for predicting the NAO over the next several months into winter time! As of right now you can see that we are in the positive range and that we are about to take a sharp drop into the negative range later on this week. And because of that an arctic outbreak will be likely across the Great Plains on east to the northeastern United States! Take a look beyond that time frame on that map…you can see that most of the range goes into negative range with a HUGE drop in early January. Usually a negative NAO means frequent cold air arctic outbreaks and plenty of cold air available for some snowfall! As I described above this is what the most likely result would be. Several arctic blasts likely over the eastern 2/3rds of the nation! EL NINO LA NINA OR NEUTRAL? As I have been saying all Fall so far, looking like this winter will feature a neutral state in the climate! Earlier in the summer it looked like we might make a run at an El Nino but things quickly changed as they do, because its the weather but of course! We even have quite a few members in the negative range would maybe indicate a very weak La Nina? That would be very interesting! The southern jet looks to be active but not too active this winter as such an El Nino would be. THE MAP – WHAT YOU REALLY WANT TO SEE! I have NOT changed the forecast too much, slightly move the above average snow further east in the Ohio Valley and the Great Plains but pretty much look’s the same. 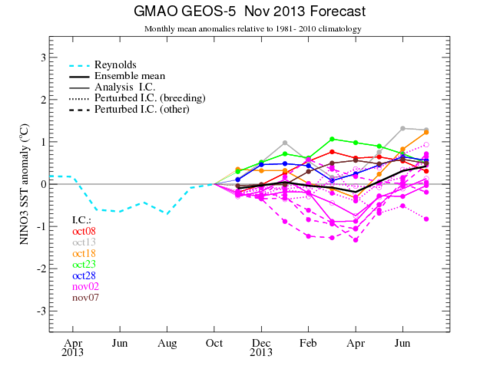 I highly expect this winter too be very interesting with extreme wild swings in temperatures, more than average. I also expect a few severe cold air outbreaks from the Missouri river on east to the northeastern United States, with Alberta Clippers becoming plentiful and dropping a quick 3-6″ here and there. Larger storm systems will take shape and pound parts of the Plains and Great Lakes as well as portions of the Ohio Valley. The storm systems look to really get going and bomb out as they head towards Michigan . Lake effect snowfall will be rather extensive this winter. The deep south will experience a couple really good cold snaps along with icing potential for a couple major storm systems especially later in the winter time! All in all we will continue to take back what a horrible snowless winter it was a couple years ago when the temperatures I can recall were in the 60s in January! Well the final winter forecast has been issued so please share along with your friends and have a great week! Snow Day is a weather forecasting service provided by Craig McPeck. Snow Day offer's long range winter forecast's issued every Fall as well as forecasts concerning snowstorms, ice storms and brutal cold air. Forecasts are issued on a regular basis.